While China is notorious for producing knock-offs and fake versions of everything from luxury bags to expensive watches, they’ve now become much more creative. 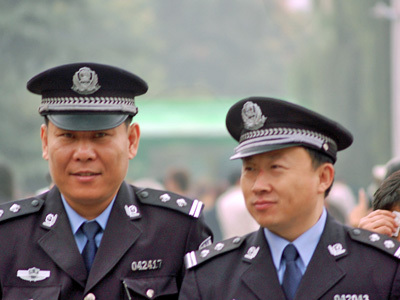 Chinese police recently uncovered an entire fake police academy in a sting operation, The Telegraphreports. The academy in Weifang claimed to be a subsidiary of the real Jiamusi People’s Police Academy, even possessing a doctored letter of recognition from the genuine school. The fake school offered prospective students three years of tuition on campus, state-of-the-art equipment, and training by veteran officers. Graduates would receive a diploma at the end that could apparently get them a job on any police force in China, according to The Times of London. The brains behind the operation was one Zhao Qingxin, a former instant-noodle entrepreneur turned admissions director at an actual school, who spent three years in jail for blackmail. Qingxin later resigned and used his savings of 200,000 yuan to finance his scheme, the Guardian reports. He even rented land for a campus and hired retired soldiers, fake uniforms, and walkie-talkies to make it more convincing. He also brought on board Wei Zhao as the honorary president, which became his undoing. The police caught on when a concerned parent, “Mr. Zhang”, called them to check the legitimacy of the school. Policewomen posing as students went to Zhao to enroll, according to Xinhua. Zhao boasted that he had friends in high places that could get them jobs in any police force in the country. He was promptly arrested, along with Qingxin and 22 other people.